"A great split pea soup to enjoy." In a large stock pot, add split green peas, chicken broth, water, hot pepper sauce, ham hocks, chopped onion, diced potatoes, bay leaves, dried dill weed, white pepper, chicken soup base, soy sauce and red pepper flakes and bring to boil. Reduce heat and simmer, covered for about 1 hour, stirring occasionally. Remove ham hocks and trim off fat. Remove ham from bone and cut into small pieces and return to pot. Simmer soup, covered for 30 minutes. Remove 6 cups of soup and puree in a food processor or blender and return to pot. Stir in milk and bring back to a boil and then serve. 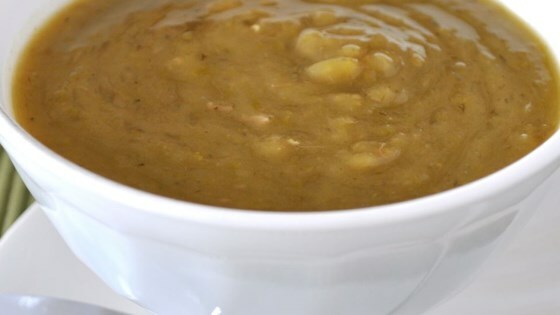 See how to make a simple, savory, and budget-friendly split pea soup. Very good!! I did what everyone said to half the water, I used more chicken broth than water so I don't have to use boullion, added ham, garlic powder, dried thyme, and parsley!